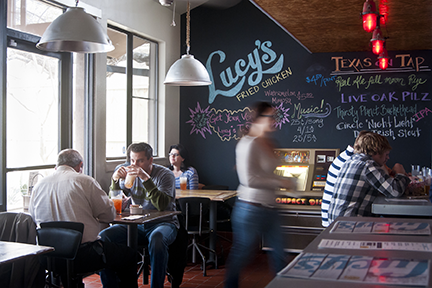 Lovers of buttery, deep-fried poultry will experience pure bliss at Lucy&apos;s Fried Chicken (pictured). Look for the colorful neon lady along South Congress and try twists on classic dishes (see: Deep Fried Deviled Eggs). East Side King also serves up rich flavors, putting a Thai spin on traditional Southern fried chicken. This popular Austin eatery has four locations and a pop-up food truck, so delicious fried goodness is never too far away. For straightforward, down-right-good chicken, go to Gus&apos; World Famous Fried Chicken downtown. You can order a two- or three-piece plate of crispy, spicy battered meat, or make it a meal with slaw and baked beans and leave completely satisfied. For a unique twist on this classic dish, try the Mother Clucker at Gourdough&apos;s for a sweet donut topped with fried chicken and honey butter. To get a feel for some of the area&apos;s fabulous seafood, Shoal Creek Saloon has seasonal daily crawfish boils where you can watch the crustaceans being prepared, cooked and served. Quality Seafood Market also serves up fresh Gulf favorites like shrimp and oysters at its daily boils. Crawfish Shack & Oyster Bar also serves great Cajun-style crawfish and oysters in po&apos;boy or entrée form, or you can grab a seat on Perla&apos;s patio and chow down on a variety of oysters (.50 cents off during happy hour) and enjoy the weather on South Congress. For a more romantic vibe, try Perla&apos;s slightly smaller sister location, Clark&apos;s, for a quick seafood-packed lunch. Enjoy a sophisticated evening of raw bar specialties and oysters at Parkside, or opt for a more laid-back experience at Hillside Farmacy. For a quintessential summer treat, indulge in some of Austin&apos;s finest heat-busting snacks such as the handcrafted artisan ice cream at Amy&apos;s Ice Cream, where the Mexican Vanilla is a must-try. Lick Ice Cream creates unexpected flavor combinations like Goat Cheese Thyme & Honey or Roasted Beets & Mint. Be sure to give your gelato some punch at Dolce Vita, where the cool treat meets liquor for the perfect summer libation. The Coolhaus food truck delivers gourmet pre-packaged ice cream sandwiches, or lets you create your own. Sno-Beach Austin, one of the original food trailers, sells colorful snow cones, with flavors ranging from almond to wedding cake. A slightly different take on the treat can be found at Jim-Jim&apos;s Water Ice, a softer, smoother form of a snow cone. Cool off with refreshing passion fruit or sweet pineapple.